What happens during an Oxygen session? Our oxygen chamber holds six people. Oxygen is delivered through a tight-fitting mask via a demand valve.The treatment itself is simple, non-invasive and painless; most people find it pleasurable and relaxing. 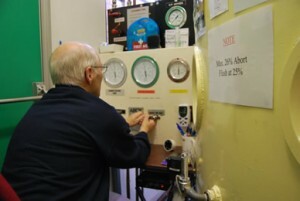 At the end of the hour, the chamber is slowly depressurised back to normal atmospheric pressure, which again takes around 15 minutes. What do I do once inside the Oxygen Chamber? You may rest, read, listen to music, use a laptop, play cards etc. during the session. We do ask you not to consume food or sweets in the chamber. There is an intercom system enabling communication with the operator. The mask can be removed at any time as the inside of the chamber is filled with air. However without breathing the additional oxygen, the benefits will not be maximised. For safety reasons some things are not accepted into the chamber – mainly items that can cause a risk of a fire – e.g. a glowing hand warmer. The operator will ensure the chamber is used safely. 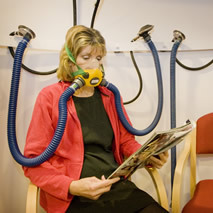 Oxygen Treatment is an extremely safe treatment with few side effects, which are usually minor and short lived. Many people feel ‘fullness’ in their ears, similar to descending from altitude in an aircraft. This can be relieved by clearing or ‘equalising’ the pressure in the ears by swallowing or the Valsalva manoeuvre (holding the nose and blowing out). The change in pressure may cause discomfort if you have congested sinuses, leading to headaches or facial pain. Tiredness can also be a side effect. The chamber can be decompressed at any time. Whilst breathing oxygen, you cannot suffer decompression sickness (the bends). You will see the Therapy Centre approx. 100 yards ahead of you on the left (37E).